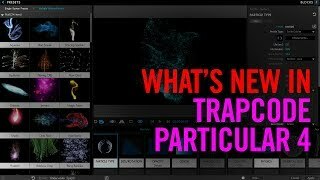 Trapcode Particular is the definitive plug-in for creating organic particle effects in Adobe After Effects, complete with depth and realistic shading, and full 3D rotation. Whether you are creating motion graphics, or realistic visual effects like fire and smoke, Particular‘s complex physics engine allows users to custom define air resistance, bounce, and turbulence to customize each particle. With GPU-acceleration and the 300+ presets, Trapcode Particular will have you turning out stunning, dynamic particle effects in minutes. 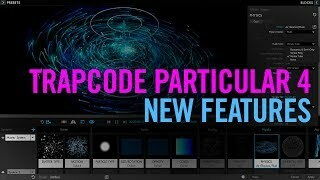 Trapcode Particular is a plugin for After Effects that lets you add particles to your compositions to bring your motion graphics work to life. Use 3D objects for even more beauty and complexity. For the first time ever, run realistic fluid simulations with the new Dynamic Fluids physics engine, or emulate particles moving through the air and bouncing off surfaces. Trapcode Particular gives you the ability to build particle effects visually, with a powerful designer that makes generating effects more creative and intuitive than ever before. Choose from over 335 Trapcode Particular presets, designed to give you a head start. Every preset is fully-customizable. Get fast feedback with Trapcode Particulars new GPU Acceleration through OpenGL. Depending on your system and setup, you could see speed boosts of up to 4X or more over previous versions. Particular uses After Effects 3D Camera and Lights so you can fully integrate your particle Effects with your motion graphics and live-action vfx shots. Give your particle systems a new dimension by using 3D models and animated OBJ sequences as particle emitters. For added flexibility, you can choose to emit particles from the vertices, edges, faces or volume of your OBJ file. Choose from Particulars library of over 60 OBJs, or easily load your own models using the new OBJ Loading Panel directly in After Effects or within the Designer. Move particles organically through the air, or bounce off of other layers, with Particulars physics engine. Includes wind, gravity, turbulence controls and more for simulating complex, realistic motion. Spawn new child particles through Particulars Aux system. Create organic trails and branching, or build splashes after a bounce. Particular 3s updated Aux system now includes the ability to add custom particles for even more variation, as well as keyframable parameters for more control.